So, your swimming pool installation is finally complete and you can’t wait to dive in the pool, but swimming aimlessly in the pool can quickly get boring. Although pools are great for swimming, exercise and cooling off in the summer, having a private pool in your backyard can make you get used to it pretty quickly and soon it becomes uninteresting, like any other thing in your house. But, the versatility of pools allows them to be a source of numerous fun activities and games whether for a kid or an adult. Although, swimming games have existed since man learned how to use water for his pleasure, modern technology and specifically the ability to have pools in your own home have greatly expanded the number of fun things that you could do in your pool. Here are some activities and games that you can engage in in the pool with just about anyone including kids or your guests. So, without further ado, here is how to make your swimming pool the center of entertainment in your house. This game is pretty straightforward. All that everyone has to do is jump in the pool and see who makes the biggest splash. Obviously, the person who made the biggest splash is the winner here. This game presents an interesting twist on the traditional volleyball game. A water balloon is used and participants are divided into 2 teams. Both teams are given a sheet with which they have to catch the water balloon. All the players of a team should hold onto the sheet given to their team in such a way that they move and catch the balloon in coordination. Now, one team will use the sheet to fling the balloon to the side of the other team who will have to catch the balloon with their sheet. Then, the second team uses their sheet to fling the balloon for the 1st team to catch and so on. The team which bursts the balloon loses. This one is more for the kids rather than adults, but even adults can take part in this and have fun. This one is timeless and never ceases to be fun. 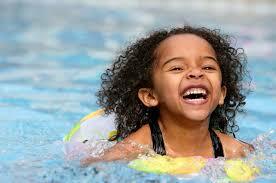 Throw a few coins into the pool and let the kids or the adults dive in and find them. Either someone who finds the most coins is called the winner or make one of the coins special by painting or coloring it and the person who finds it is the winner. The difficulty quotient of the game increases as the size of the coin gets smaller. This one is also more suitable for kids rather than adults, but adults can also participate in it. This game requires at least 4 people to play. Divide the number of participants in teams of two. One person sits on the shoulders of the other and attempts to knock off a player of the other team from their partner’s shoulders. Ideally, kids should sit on the shoulders while adults can be the supporters. This game is a twist on the classic bumper car game. Each player sits on their floaties and attempts to knock the other players off from their floaties as you would do by bumping cars in the bumper cars game. The last person still floating in their tube emerges as the winner. This game is the water version of the scavenger hunt game. An assortment of small objects such as toys, coins, plastic cards, dice etc. are thrown into the pool and participants have to find each item as announced by an announcer. The person to find the most number of objects wins. Indulge in these games and activities to ensure that your and your guests’ pool time remains as fun and exciting as the first time you jumped into your pool after the swimming pool installation was complete.